We don’t personally do that much NHL live betting, primarily because of the time commitment it requires. But thanks to Twitter, we came across a guy who does – and he’s pretty darn good at it. “DC” (follow him on Twitter @Wasaaap999) went 141-172 on his NHL wagers in 2016-17, and owned a 94-116 record in 2017-18 on the day we posted this article. Those records might not sound that impressive at first. But that 45% winning percentage had resulted in nearly +45 units of profit over the past 2 seasons because DC is consistently taking shots at bets that pay +150 or higher. And many of those great value bets were found on the NHL live betting odds. We reached out to DC to see if he’d be willing to share a few pieces of his NHL live betting strategy with the rest of us, and he graciously obliged. Before we get into DC’s NHL live betting strategy, we wanted to highlight one very interesting thing. DC places a lot of his NHL live bets while he’s at work and not even watching the games. Instead of reacting to what he sees on his TV, he relies almost completely on statistics and odds. “I believe watching the game and betting is a very bad habit. Mostly you get deceived or emotionally involved,” DC said. With that in mind, here are 3 NHL live betting tips that have been key to DC’s success. “Most people can sense traps, but not necessarily know what to do with them,” DC said. “Let’s say the Patriots are home to the Browns (in the NFL), the line is -3 and there are no major injuries. That basically tells you it’s a trap, but the public still jumps on them because no sane person wants to take the Browns. As an example, DC pointed out to an October 2017 game when the Colorado Avalanche was a small favourite at home to the Chicago Blackhawks. 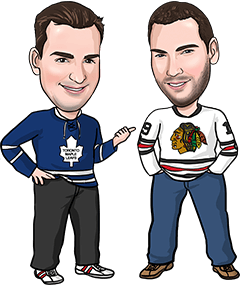 Considering Chicago had reached the 100-point plateau in its 5 previous seasons and the Avalanche collected just 48 points in 2016-17, most bettors would have expected the Blackhawks to be favoured over an Avs team starting backup goaltender Jonathan Bernier. It smelled like a trap. That’s where live betting can help you. “Let’s assume we believe it’s a trap and we want to take the Avs, but not at -110. If Chicago opens the scoring and the first period finished at 1-0 or 2-0, we can take a very generous +180 moneyline, or get the +1.5 puck line at plus money. Even if it loses, losing a +180 is definitely smarter than losing a -110 in my opinion,” DC said. Live betting can also give you a chance to get a heavy pre-game favourite at a much lower price if they get off to a poor start. Just like time of possession can tell you a lot about who’s controlling a football or soccer game, various statistics can also give you a sense of which team is playing better in an NHL contest. The day before talking to us, DC had placed pre-game bets on the Red Wings (at Florida) and Coyotes (at New Jersey), each of whom were road underdogs in the +130 to +140 range. Even though the Red Wings led 1-0 after one period and Arizona had a 3-2 lead through two periods, DC hedged both wagers through live betting because he could tell by the game stats that those leads probably weren’t sustainable. “Coyotes started great, lots of shots and took a 3-2 lead after two periods, but lots of the offence was generated due to four first period power-plays. Although they scored on a power play, they had also given up a shortie, and the Devils, without getting many power play opportunities, had a similar amount of shots on goal,” DC said. “In the Wings game, the power plays were pretty even but the Panthers were hammering with twice as many shots and taking other minor factors into account, I hedged after one period with Panthers +125,” he added. DC ended up splitting his two pre-game bets, which would have already resulted in a decent profit because he backed a pair of underdogs. But by hedging those wagers with a pair of plus-money live bets, he guaranteed himself a profit on both games regardless of the result. Again, when a betting line doesn’t seem to make sense (like a really strong team being a small favourite or even an underdog against a weaker opponent), the common reaction is to call it a trap. Another way to look at it, though, is that the oddsmakers are implying what is most likely to happen. DC pointed to a game this year in which the Oilers were -135 favourites over Washington before the game began, but were down to -108 on the moneyline when the game was tied 2-2 after 2 periods. Sure enough, Washington outscored Edmonton 3-0 in the third period to prevail 5-2. You can also use this oddsmaker-implications approach to hunt down some big longshot winners. DC did just that in the Chicago/Colorado game we mentioned earlier, when the Avs held a 5-2 lead going into the third period. “I looked at the intermission line and saw Over 8.5 at -280 odds and Over 9.5 at +195. This basically tells me that the game has a very high chance of finishing at exactly 9 goals,” he said. “But where can you find value? Over 8.5 is juiced (really high), so you can try taking Over 9.5 but 3 goals (in the third period) are a lot harder to come by. DC ended up cashing that +1000 ticket as the Avalanche and Blackhawks traded goals in the third period, though he had to sweat things out a bit as Chicago pulled its netminder for an extra attacker down 6-3 with 5 minutes left. Teams pulling their goalie late in regulation is always a potential factor you need to keep in mind when live betting, although you certainly don’t expect it from teams trailing by 3 goals or more. As we said in the introduction to this article, time constraints prevent either of us from doing much NHL live betting at a serious level. But when we have dabbled in it, we’ve found an edge by using the same strategy as we use to exploit value in the first period lines. Just like teams develop tendencies over a season to play high-scoring first periods at home or struggle in first periods on the road, you’ll find some teams face similar issues or enjoy similar success in the second and third periods. The Pittsburgh Penguins were a perfect candidate for live betting in 2016-17. Part of it was that they were often playing from behind after the first period (they were actually outscored in first periods at home all year), but Pittsburgh was absolutely dominant in the thirds. First period splits (you can find this information on the NHL’s website) can also be used in a live betting strategy. If you know a team is characteristically poor in first periods (like the Penguins were last year), you can avoid betting on them before the game starts and instead wait until the second or third period to place your bet. That way, you’re only betting on a team when they’re typically at their best. You might also catch the added bonus of getting them at much better odds when they are tied or trailing after a slow start. Just like pregame betting, NHL live betting will come with its share of cold streaks and bad beats. It can also be a bit dangerous in that you find yourself chasing games more often. If you place a live bet on a team and then they get scored on and the odds are even more tempting, it’s often hard to resist betting on them again. Stay disciplined, have a plan, and try to stay focused on the big picture. “There are hundreds of different approaches in live betting, or all betting in general. Finding the one that suits you is most important,” DC said.